Caral Ni Chuilin says unionist politicians are cowards. She gives two reasons for this accusation. One is that they lack the courage to show the leadership necessary to stand up to the worst elements in the so-called ‘loyal orders’ and the despicable marching bands they hire. The second reason is that they ran and hid from the media after the deplorable scenes they provoked last Saturday. None of them would debate with Ms Ni Chuilin on Monday morning. The second of those reasons is true. Unionists ‘politicians’, for want of a better word, knew they hadn’t a leg to stand on since they had encouraged people to ignore the Parade Commission’s determination and break the law. Not one of them condemned this unlawful behaviour. How could they? Tellingly the UUP leader, who didn’t sign up to the letter published on Saturday remained silent also. However, Caral Ni Chuilin’s first reason is based on a false premise, namely that unionist leaders disagree with the behaviour of the marchers and bandsmen but haven’t the guts to tell them to behave otherwise. There’s no evidence for that. On the contrary. the evidence shows unionist leaders to be by turns, irresponsible, deplorable, inflammatory, rebellious and contemptible because they do agree with the disgraceful scenes at St Patrick’s at the weekend. Apart from not one of them uttering a word of rebuke to their followers breaking the law, the outrageous letter they signed up to was tantamount to a call to arms to do exactly what many did in Donegall Street. Then again when have unionist leaders been any different? It is entirely appropriate that the loyal orders are this year commemorating the 1912 Ulster Covenant, the occasion 100 years ago when unionist leaders defied their own parliament, the rule of law, brought the gun into Irish politics and promised sedition. Unionist leaders don’t ‘pander’ to the worst elements in their community. They provide the model for the worst elements. If there’s some disagreement about the motives of unionist leaders encouraging law-breaking, there’s no argument about the fiasco that was the PSNI operation. It was Keystone Kops stuff. A chief inspector walking up and down with a loud hailer trying to make himself heard shouting, “stop playing music”, while passing bandsman played with greater vehemence. The police allowed hundreds of loyalists to come up Donegall Street behind them to intimidate the protesters outside St Patrick’s. 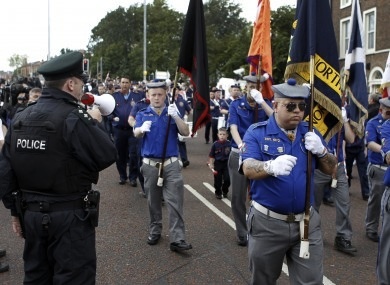 This tactical gaffe meant that if they tried to stop the prohibited band from marching the police would have been the meat in a loyalist sandwich because scores of yahoos were also accompanying the march. A child could have foreseen this situation developing even if it hadn’t been for the inflammatory statements of unionist politicians. Yet the PSNI didn’t plan for it so was powerless when the inevitable happened. The marchers outwitted the police and made asses of them. In short the PSNI made no provision for policing the ban on a band marching or others playing music. No wonder the Catholic bishop, whose parish St Patrick’s is, expressed astonishment that “no visible effort was made to enforce the lawful restrictions” on the march. There was no invisible effort either. Compare that approach with the water cannon and plastic bullets deployed to force a tiny group of marchers past Ardoyne each year. There is demonstrably more emphasis on forcing unwanted parades past nationalist districts than protecting nationalists from sectarian abuse and insult. See Rasharkin. You didn’t notice any of the people who breached the Parades Commission ruling being arrested or even interviewed on Monday morning did you? No. the cases will still be dragging through the courts next July as the PSNI forces the same crew past Ardoyne. Sinn Féin needs to step up to the mark on this. Its no good Caral ni Chuilin spluttering out of her depth on BBC while her party leaders sun themselves abroad -- altogether now, on the average industrial wage. It’s striking that the best and most biting criticism of the police came from a bishop and not from Sinn Féin. For a Sinn Féin politician to expect behaviour any different from the DUP is tragically naive. She should have been holding the police to account.